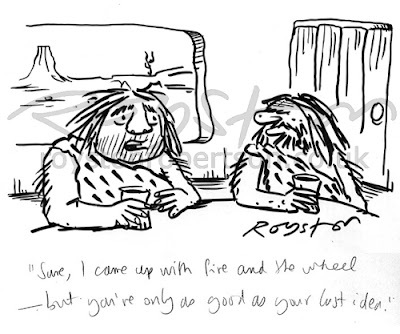 "Sure, I came up with fire and the wheel – but you're only as good as your last idea." This original drawing is in a selling exhibition of cartoons in my native North Yorkshire, although as I live 275 miles away I probably won't be going to see the show. The exhibition, Three Centuries of Cartoon Art, is organised by the Chris Beetles Gallery of St James's, London, but will be held at Nunnington Hall, near York. 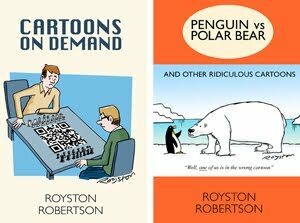 A colour version of the cartoon was in Prospect magazine in 2008. You can see the full exhibition online here. I love your comics. Am I allowed to post them on my blog and link back to you? Thanks, Tara. Yes, I've no problem with people doing that if a link is provided. I would charge fees for a commercial site. And I do prefer it if people contact me and ask, as you have done, so that I know where the cartoons are appearing.